Canada has turned its northwest wind toward Minnesota and we are finally enjoying real Minnesota summer days with dewpoints in the 50’s, temperatures in the upper 70’s and low 80’s, and that wonderful cool Northwest breeze. This weather brings a flood of memories — not of baseball in the sun, swimming, playing tennis or boating. No. It brings a flood of memories of reading, usually outdoors in the shade either on a porch or under a tree, the sounds of swimming, water-skiing and boating on the lake in the background, a lawn mower grazing with a buzz nearby, and the smell of suntan lotion laced with coconut oil. Urban noise pollution wasn’t a part of my childhood, but a lake house, a library card, and lots of free time were. Today, I’m reading a classic science fiction novel published in 1977 that reminds me of the mid-1970’s rage for disaster movies — Lucifer’s Hammer by Larry Niven and Jerry Pournelle. It’s a fat paperback — my favorite kind — full of characters I can relate to in some way, caught on a planet in the path of an ancient comet. Will they all survive a direct hit? What will that hit be like? And who cares just how plausible the premise is, right? Summer reading. Book marketers go immediately to the stereotypical beach reads: thrillers, mysteries, more thrillers, and action adventure stories set in lost worlds of the past or far future. What are your favorite summer reads? Is there really such a thing? I have a particularly potent memory of one week in August when I was in junior high school. My family was at our lake house. I had been to the library and checked out a pile of books, among them, Sir Arthur Conan Doyle in a collected works omnibus of Sherlock Holmes stories. That August week was unusual for its weather: cool, overcast, often foggy from the humidity, with especially damp chilly nights. We had built a fire in the fireplace and hunkered down inside. I read on the squishy soft sofa upholstered with pink flowers on a dark green background about 6 feet in front of the fire, engrossed in The Hound of Baskervilles. The weather outdoors with its cool enveloping mist created the perfect environment in which to read this scary story. And wild hounds could not have roused me from that sofa. When I was ten, I discovered the romantic suspense of Mary Stewart in her novel The Moon-Spinners. It was blistering hot outdoors, too hot to sit in the sun or go boating, and after a swim, I would curl up on the rocking lounger (upholstered in dark green vinyl) on the front porch and read about the rugged landscape of Crete, the heat of the Mediterranean sun, the beautiful beach, a small inn run by a Greek family and the mystery surrounding a young Englishman named Mark. From that summer on, I was convinced that the British were the masters of mystery stories. The year after I graduated college, my first year living in Minnesota, I picked up a book with a strange title: Watership Down by Richard Adams. It was the title that caught my eye. Once I began reading, I couldn’t put that book down, and to this day I’m still amazed that a novel about rabbits could have so powerfully held me in its grasp. A friend had invited me to spend a week with her and her family at their lake cabin in the north woods and I took the book along with me. Now I associate that specific location in northern Wisconsin with reading Adams’ novel. When summer rolls around, I feel my attention as a writer and a reader circle away from anything heavy or philosophical and toward fun. And fun means mysteries primarily, although this summer I’ve added a science fiction disaster thriller to the mix. In addition to the Niven/Pournelle novel, so far this summer I’ve read The Private Patient by P. D. James, Death and the Maiden by Gerald Elias, Finding Moon by Tony Hillerman, and Airs Above the Ground by Mary Stewart. What have you been reading this summer? Any recommendations? How do you choose books to buy? In another word, perseverance. Success and what it means has been in the back of my mind this week. Sam Shepard died as the week began, and reading about his life as a playwright, writer, and actor proved provocative to my mind. Shepard told an interviewer once that he felt most comfortable in the theater, writing for the theater. That made me ask myself where do I feel most comfortable in my creative life? How does that feeling relate to production and success? I know I am happiest when I am writing fiction. This morning, I ran across a short essay by Hope Clark, a mystery writer who has a well-known newsletter called Funds for Writers. In this essay, Clark wrote about what the most important thing is about being a writer. Is it getting credit for writing and publishing? Or is it giving the world a great story experience? My next thought was that maybe success could be measured in just how great the story experience was that you’ve created. But how does anyone know that? And could one person’s great story experience be another’s failed story experience? Today, for example, I finished reading a novel that has won rave reviews and that I’d heard friends and acquaintances rave about for a long time. I didn’t think it was that great at all. I don’t rely solely on what my friends and acquaintances recommend when I’m looking for a great story. I read reviews, I subscribe to the NY Times Book Review newsletter, as well as reading the review sections of other papers and magazines. I have to admit that I don’t pay much attention to marketing blurbs or any kind of promotional pitches. What I pay attention to are the descriptions of the novel’s story, and then a little to genre. I love books, though, that blend genres or bend them. So I guess it’s important to know your own taste and interests before going off to Amazon or a bricks and mortar store to buy books. I do miss bricks and mortar bookstores where I could wander around and actually see, touch, and smell the books! In her essay, Clark describes the kind of promotional copy that will turn her off a book, and the kind of promotional copy that will spark her interest. Her ultimate point in the essay, though, is that authors need to remember their responsibility to readers, i.e. to provide them with a great story they’ll be glad they paid good money for and spent their time reading. That whatever they say in their pitches and promotions, they focus on the story. So, Mr. Churchill, I think I’d define success for a writer in this way: Committed to writing the best you can, knowing what makes your stories great, giving your readers one great story after another, and attaining the recognition of being a writer who produces great stories, i.e. the kind of stories that people want to buy and read. What draws you to a book? How do you choose the books you buy? What was the last great story you read? Please respond in the comments section! Thank you to Adam at Write Thoughts for nominating me for the Liebster Award! It is like a blogging chain letter of sorts that asks of the recipient a bit more than the conventional chain letter. I’ve responded to a similar award back in 2015 that was set up a bit differently from this one. This will be the last time I participate in this sort of thing. If any of my readers receive such a nomination and think of me for their list of nominations, please just skip me! 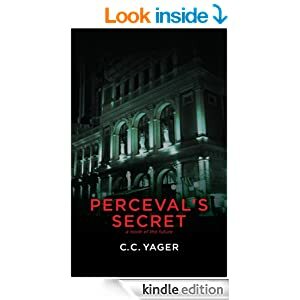 I would like to keep this blog focused on the Perceval novels, writing issues and interests, classical music, and the occasional book or movie review. 1. What is your favorite book, or if you prefer, your favorite author? I really don’t have one favorite book or author. There are certain authors whom I read faithfully because of the high quality of their prose, plotting, character development, story, and dialogue. Those writers are: P. D. James, John le Carre, Daniel Silva, Madison Smartt Bell, Virginia Woolf, Connie Willis. and Ursula Le Guin. I just added Connie Willis to this list, and if you were to ask me this question a week from now, the list might be a little different. 2. Is there a country you have always wanted to visit, if so where? England. I’ve been to the other countries on my list: Russia, Austria, Germany, New Zealand. I’ve been to Northern Ireland and traveled through London on my way to various places, but have not stayed to actually visit England. I’d also like to return to Finland. 3. What do you enjoy about blogging? When I began blogging, I was extremely nervous about putting myself out there on the internet. Who would read my posts? Would they like my ideas? Would they read my Perceval novels? The first few months were a bit nerve-wracking. It’s been nearly 10 years now, and I find that I enjoy getting the ideas for posts, thinking about, exploring and researching those ideas in order to write about them, and then seeing if anyone responds. I love hearing from people so it’s been especially fun when readers leave comments and a conversation has ensued. 4. What’s your preferred writing space? I write at my desk in my living room. The desk faces the wall between the kitchen and the hall that leads to the front door. Behind me is the living room and its windows. I see the windows reflected in the large picture that hangs over my desk. At least as much as I can see between the multitude of colorful post-its that I’ve stuck to the picture with notes to myself. 5. How do you find inspiration? In life. In people. 6. What do you like to do for fun when you need a break from writing? Since I’m writing all the time even when I’m not at my desk, it’s rare for me to completely separate myself from it. However, I love movies, theater, and classical music concerts, spending time with friends, and walking around the lake that’s a block from where I live. 7. What started you down the road of writing? I honestly do not remember if there was one spark that got me going. I read voraciously all through elementary school, and I wrote plays and short stories starting in sixth grade. I do remember that one story in particular started in my mind when I was doing my lunchtime stint as a safety patrol kid outdoors and noticed the grill on the storm drain that ran along the curb. I’ve written about that here. 8. What’s one story you keep recommending to others? I do not have one story or book that I recommend to others all the time. I usually recommend authors, or sometimes a book I’ve recently read that impressed me. 9. How do you keep yourself motivated? It can be especially tough when life keeps butting in! I think about the characters. They keep me motivated. 10. What superpower would you choose and why? So, is this a trick question? The geopolitical situation right now is in crazy flux. Russia continues to try to reassert itself as a superpower. China is rising into that status but isn’t quite there yet, especially when they have some interesting issues with other countries that don’t bode well for China to become a superpower. The US is definitely enjoying a decline in influence in the world, especially after last year’s election. However, the US still has the economy, military and weaponry to remain a superpower. The other countries are in an increasingly stronger position to challenge that status. I live in the US, so I suppose I’d choose the US, but honestly, I’ve lived in Europe and almost prefer that way of life. 11. What four people would you invite to a dinner party; contemporary, historical, or fictional? Ludwig van Beethoven, J. S. Bach, John le Carre, and Queen Victoria. I hope you all will respond, but from my perspective, it’s not required at all!